Equity Release Matters | What is a lifetime mortgage? The amount you can release will depend on your age (or the age of the youngest homeowner) and the value of your property. Please use our Equity Release Calculator to see how much cash you could potentially release from your home. To use this calculator, simply provide us with a few details about yourself. 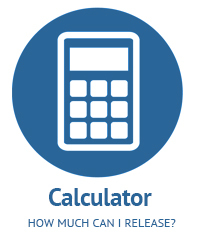 It is important to remember that this calculator will provide you with some guidance in terms of how much you could release but does not take into account your personal circumstances. The amount you could actually release from your home could be more or less, depending on your age and circumstances and also on the type of plan you take out. For some plans, certain health conditions may mean you can release more equity from the value of your home. In general terms, the older you are and the more your home is worth, the more money you will be able to release from your property. If you are interested in finding out more, our expert advisers at Later Life Matters can provide you with a personalised illustration and help you understand exactly how much you could or should release. To find out the actual amount you could have made available to you, please contact us on 01992 500800 or alternatively complete our online enquiry form and an adviser will contact you. Equity release may involve a lifetime mortgage or a home reversion plan. To understand the features and risks, ask for a personalised illustration. Equity release is not right for everyone. It may affect your entitlement to state benefits and will reduce the value of your estate.